OK, I admit it – I’m quite lazy when it comes to moisturising my body in the autumn and winter months. Preferring to hide my skin under layers of super soft cashmere, stretchy jersey, and fluffy wool, I don’t really see the point in spending time (and precious pennies) on keeping my skin looking and feeling silky soft. Who exactly is going to see it anyway? This year, however, I’ve been forced into an action plan, as my skin has suddenly become dry, flaky, and itchy. I need to moisturise morning and evening to keep it supple and comfortable – and I’m really struggling to conjure up the motivation. So to make things a little easier, I’ve been working on a few lazy girl shortcuts – and you are more than welcome to join me in the hydration quest by nabbing a few for yourself! If you’ve ever had a professional massage, you’ll remember how soft and silky your skin felt afterwards. So my top tip for lazy skin hydration is to get somebody else to do it for you! Whether you opt for a spa massage (a heavenly treat during the winter months) or ask your partner to pamper you at home, your skin will receive an indulgent shot of long-lasting moisture to boost hydration levels. If you are a single girl – or can’t convince your partner to treat you to regular massages (I sympathise on that one) – there’s another super-easy way to drench your skin in moisture. Simply pour a generous glug of bath oil under a running tap, sink into the water, relax for 20 minutes, and pat skin dry with a towel when you step out. The oil will cling to your skin for hours, completely negating the need to moisturise. Easy! More of a shower girl? No problem, as your morning shower gel has the potential to infuse your skin with much-needed moisture. To get this right, you need to pick the richest shower gel you can find (a lot of shower gels that promise to be ‘hydrating’ leave skin feeling disappointingly dry). Look for ingredients like cocoa butter, shea butter, and almond oil, which will pamper, cleanse, and moisturise skin in one fell swoop. The other shower option is to treat yourself to a rich Shower Oil – a big trend in beauty right now. Whilst applying oil to dry skin can be both time-consuming and messy, it takes a matter of seconds when skin is wet. Save it until the very end of your shower so that it is still clinging to skin when you climb out of the cubicle – and you will be rewarded with silky, ultra-supple skin throughout the day. When I am forced to spend time moisturising my body (oh, the hassle), I want the results to last – so I only ever bother with creams that promise 24-hours of intense hydration. That way, I only have to bother in the morning after a shower, knowing that it will keep my skin supple until the following day. If it’s got a fabulous fragrance too, that’s an added bonus! 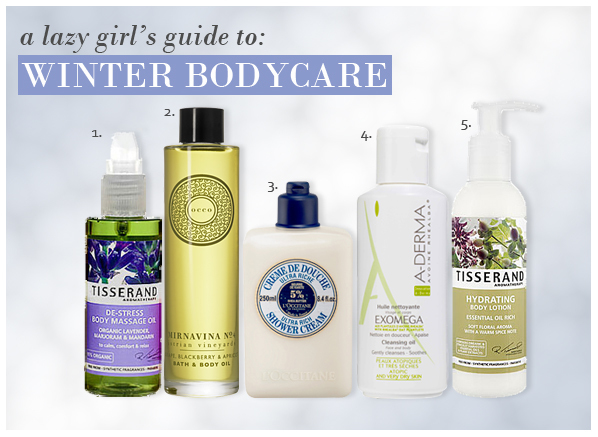 This entry was posted on Monday, November 7th, 2011 at 10:02 am and is filed under Guest bloggers, Skincare. You can follow any responses to this entry through the RSS 2.0 feed. You can skip to the end and leave a response. Pinging is currently not allowed.